The tradition of cherishing poinsettias during the holiday season was first introduced by a Franciscan priest in Mexico during the 17th century. In 1825, the poinsettia was first introduced to the U.S. by Joel Robert Poinsett who was serving as an ambassador to Mexico. In 1836, William Prescott, a historian and horticulturist, named the plant "poinsettia" to honor Poinsett’s introduction of the plant to the U.S. Further, the U.S. Congress declared Dec. 12 as National Poinsettia Day to commemorate the death of Poinsett in 1851. Today, poinsettias are one of the most popular Christmas plants and the bestselling potted flowering plant in the U.S. More than 70 percent of all wholesale marketed poinsettias in the U.S are grown at California's Ecke Ranch, which has been in a family business for more than 80 years. Poinsettias display a dazzling array of colors. 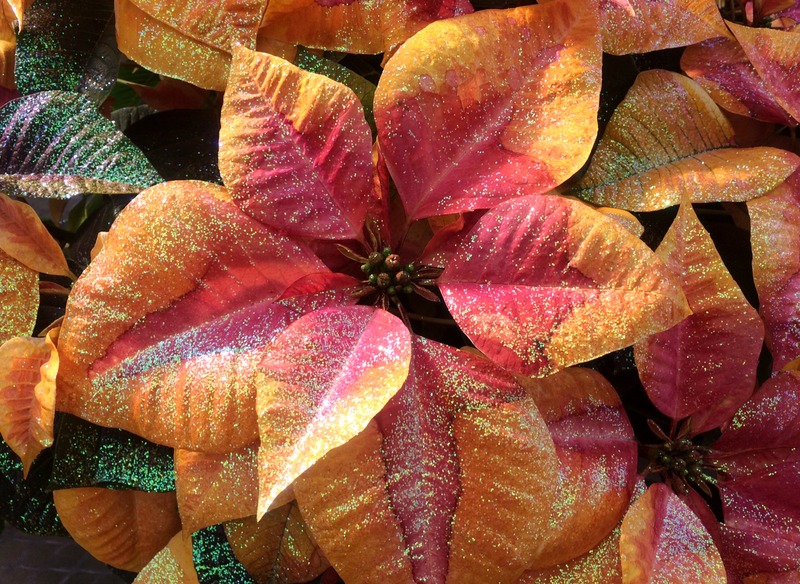 When shopping for poinsettias, plants with a uniform distribution of colorful bracts on all sides should be selected. Bracts are often misnamed as flowers, but are actually modified leaves. The bracts should have a full color display and be devoid of many green edges. Wilted poinsettias with leaves with brown edges should not be selected, nor plants with insects like whiteflies on the undersides of the leaves. The poinsettia's small yellow flower is at the center base of the colorful bracts. For long-lasting bract display, a plant with flower buds that have green or red tips is best because they can hold the bracts longer than an open flower covered with yellow pollen. If the temperature outside is below 50 degrees Fahrenheit, the cold-sensitive poinsettia should be covered with a sleeve or plastic bag to protect it. Once the poinsettia reaches its new location, the sleeve or bag should be moved from around the plant immediately. Holes should be poked through the foil on the bottom of the pot, which should be placed in a saucer to catch excess water. The poinsettia should be placed it in a spot that receives six hours of indirect light. It should not be directly exposed to radiators or heat vents, nor should it touch a cold window pane. To extend the colorful bract display, the indoor day temperature should be kept at 65 to 70 degrees Fahrenheit and a 60 degrees at night. Watering the poinsettia can be tricky, especially during winter, so it's best to check moisture daily by poking a finger up to the first knuckle into the soil. When the soil media is dry, the plant should be watered thoroughly until water drains out. The plant should not sit in the excess drained water in the saucer. The poinsettia should not be fertilized during its bloom. If proper care is taken, the bloom can last six to eight weeks. If the plant will be saved beyond the holiday season, it should be fertilized with a complete soluble house plant fertilizer once a month. To rebloom the poinsettia for another year, the plant should be covered during the evening hours with a light-proof bag and stored in a dark, cool closet for 15 hours beginning from the first week in October to mid-December.